Looking for some new Keto friendly recipes? 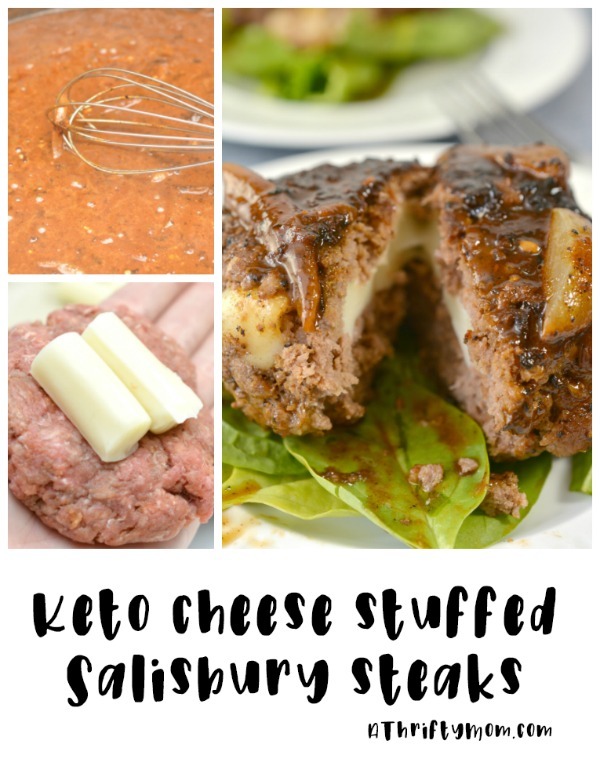 This Keto cheese stuffed salisbury steak recipe is so good and will be one the whole family will enjoy. This salisbury steak recipe smells so good when it is cooking. The whole family will enjoy it, even if you aren’t all doing keto. This recipe makes 6-8 patties. In a large mixing bowl, combine the ground beef, egg and crushed pork rind crumbs. Either crush the pork rinds using a food processor, or place them in a ziploc baggie and crush with a rolling pin until fine. Mix in the onion powder, garlic powder, tomato paste and 2 teaspoons of Worcestershire sauce. Add salt and pepper to taste. Mix with your hands until well incorporated. Cut your mozzarella sticks into 3 equal pieces. Form a patty out of the meat mixture. Place two pieces of cut mozzarella stick into the center of the patty, and then cover with another small patty of the meat mixture. Form 6-8 stuffed meat patties. Heat 1 tbsp of unsalted butter and 1 tbsp of olive oil in a large skillet over medium-high heat. Once your skillet is hot, add the meat patties and cook about 5-6 minutes on each side, or until the meat is cooked through to your desired temperature. Remove the meat patties from the pan placing them somewhere to keep them warm. Pour out some of the pan dripping if necessary, and add in the onions. Cook the onions until browned and tender. Mix in 2 cups of beef bone broth, and scrape the bottom of the skillet to deglaze it keeping all the yummy bits. Whisk in 2 tbsp of softened cream cheese. Add in 1 tsp of tomato paste and 2 tsp of worcestershire sauce, as well as salt and pepper to taste. Reduce the heat to medium, and simmer the sauce until it thickens. **(optional) add in an optional ¼ cup of heavy whipping cream to help it thicken as well if desired. Previous articleIt’s a Busload of Pigeon Books! Next articleFloral Tunics | S-3X for $18.99 (was $36.99) 2 days.